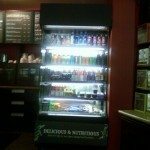 For a few months in 2009, three Seattle area Starbucks tested some alternate food items at their stores. This was such a tiny food test it really almost is not worth mentioning on this blog. It was only 3 stores, and a few short months late summer to fall 2009. The test is over, and I already miss buying Rachel’s yogurt at Starbucks. The few test stores in this test had a tall unique cold case filled with a few alternate food and beverage options. Included in the cold case were things like hard boiled eggs in packs of two, carrots with ranch dressing, string cheese, hummus and chips, Izze’s soda in cans, and Rachel’s organic yogurt. Starbucks is Testing Coconut Milk. Salami and Cheese at Starbucks. Nailing coffee by the cup. No more big batches of coffee at Starbucks. And MUCH more. Caesar and Cobb salads spotted in Starbucks. Holy cow! What a bunch of options! I know that doesn’t necessarily fit into our core coffee business… but I would love those extra choices. I like the blog posts in which you talk about test markets, like the honey Vivannos. 🙂 You do a great job at hunting out interesting subjects. So is Starbucks trying to be a 7-11 or just another cheap run-of-the-mill convenience store? Steve, did you not understand what I wrote? It was a TINY test. Let me ask you, how do you think ANY business will know what will sell if they don’t test a few items? Do you want to suggest some other way to test food items other than to do a small scale test of sales? Are would prefer that companies just throw food in their stores without having any idea what will sell? What part of “small test” is hard for you to understand? 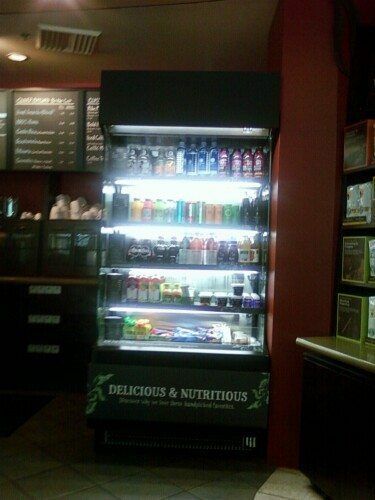 I was thinking last weekend that I wished Starbucks had good snack options that aren’t pastries… Carrots, hummus, etc. would all be great additions! I wish my starbucks would try out some different food options, the Rachels yogurts sound perfect. I think that some food items like the yogurt would be a good thing to sell but things like boiled eggs (yuck) don’t seem to have any place in a coffee house. I can understand the yogurt and sodas, but I don’t understand why they’d even test boiled eggs. Just my opinion of course. I think it’s great that they’re testing out some new things. Starbucks usually isn’t the first place I think when I’m hungry. Ya got me there Melody. All I was trying to point out is that Starbucks is a COFFEE house and should, in my opinion, stick to coffee relasted products. Pastries and cookies go with coffee for example. Sandwiches go with coffee but what’s the does yogurt have to do with coffee? But as you said it was a small test and probably didn’t cost Starbucks too much to find out yogurt and coffee isn’t a good mix. That makes me mad Steve. You are the king of speaking out of both sides of your mouth. (1) You proclaim that you want Starbucks to be a coffeehouse, but when it comes down to it, you never exhibit any interest in whole bean coffee when you write here or on MSI. You never talk about coffee variety, tastings, cuppings, or growing regions. You talk about the beverages which are Venti Liquid Candy Bars – Pumpkin Spice Lattes, Dark Cherry Mochas … If that’s what you want, that’s fine! But that’s pathway to being everything but about the coffee. Sugar and more sugar and more sugar. (2) Here, you’re blasting Starbucks for trying a little food, yet on twitter you proudly wear a “Tully’s Twibbon” – Have you seen the food offerings at Tullys??????? It’s no more coffee focused than Starbucks. For heaven’s sake, you can get ICE CREAM at Tully’s. You can get quiche, pie, pastries, and even carbonated soda! (3) You’re not very loyal as a customer. Starbucks gave you a GIFT of 10 percent off products. You did not EARN it. You did not deserve it. I don’t like the new program either, but it’s not enough to make me suddenly wear new stripes and rave about “Tullys”. That’s not loyal and pretty shallow that essentially, you dump Starbucks because the GIFT they gave you is coming to an end. I believe you’re a customer, and maybe even a frequent customer, but frequency and loyalty are not the same thing. (4) Starbucks has been selling yogurt for a long time. It’s called breakfast. Yes, it fits in a coffee house. Melody re: Steve. U make me laugh sometimes when Ur “lawyer” side gets fired up. I can just C U in court like on Law&Order. While I sort of agree they should stick with more “breakfast friendly” types of foods (ie, yogurt) that go with coffee, I know that I don’t just frequent Starbucks in the morning. When I was working downtown, there were very few places to run and get a quick lunch- I would have LOVED to be able to grab hummus and get back to the office (the location downtown did not sell any sandwiches or any other lunch items I’ve heard of other stores carrying- maybe because it was Alaska?). And while I love coffee, I’ll admit to buying iced tea a lot too. I love the Rachel’s yogurt! Unfortunately, I don’t pay much attention to the cold cases when I visit Starbucks. I can see how some coffees would not pair well with the tart, fruity flavor of yogurt, but the people who look for higher-end, non-junk food might appreciate the option. I could easily imagine someone getting a Vivanno and a cup of yogurt, or a plain latte and yogurt. starbucks needs to carry yogurt at every store! yum! I wrote a suggestion to SBUX about 15 years ago that they should serve SMALLER sized treats, but the treats just kept getting bigger. I was thrilled they FINALLY went small, now…big mistake. More European, more Seattlish, big mistake to end the idea. Thanks for your comment SBsmooth – One interesting thing is that as I read about some of the new food offerings coming 1-12, a few of the items sound familiar – I think I might have seen them during the “WOW” test. I loved that test case in the Greenlake Starbucks, though it was out of the normal flow of browse-order-pickup (it was sort of over on a merchandise wall, and I never seemed to notice it until after I’d already ordered). I’m a huge Rachel’s yogurt fan, too; and everything in that case seemed to lean healthier than the majority of Starbucks food offerings. I’d love to see some of those items make it onto the regular menu, too. Especially Rachel’s yogurt! And for me, yogurt and coffee make a great breakfast.